Welcome to our school website. We’re glad that you’ve chosen to share a part of our school life. 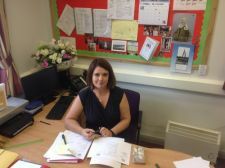 On this website we aim to provide an insight into our school & a range of information about how we work. We hope you find your visit to our website useful and informative. Our school is at the foot of Slieve Gullion and is in the heart of the community. We value all our children and our families. Every member of staff and all the school’s governors are committed and work very hard to provide the very best opportunities to all pupils in order that we develop the ‘whole child’. Our school motto - Léann, Grá, Sult, (Learn, Love, Enjoy) - demonstrates our school vision to develop each child holistically, enriched by the Catholic faith. We want children who come to our school to be happy, safe and to enjoy their learning. The school provides a rich variety of activities in and out of school hours. We are all rightly proud of our many achievements and always realise that everyone can always improve in what they do. We hope that this website helps us achieve our aims and values that we hold here at Dromintee PS and helps give you an insight into life at our school. Please take a few moments to visit our class pages to get a taste of life at DPS. There you will see photographs and videos of just some of the wide variety of activities our pupils enjoy and take part in. We hope to develop our already strong links with grandparents though a series of intergenerational projects over the next while. We would welcome all your thoughts and ideas. We want to focus on ‘ó ghlúin go glúin’. We want to pay tribute to the rich heritage of the area taking inspiration from the late local historian Michael J Murphy. Finally thank you for visiting our website, we would welcome any comments about it and this may be done by contacting me at the school. 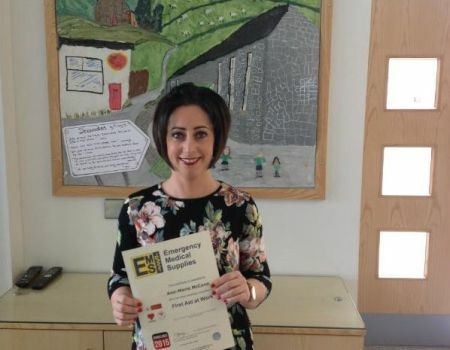 Miss McCann recently completed her First Aid Training two day refresher course.